It’s the next most wonderful time of the year! The first being Christmas of course which is well and truly over in our household which means I am back from my blogging break! We aren’t sad about Christmas being over though because it means it’s now time for the various flowers to start blooming around the [main] island! January 9 – 31st, 10.00 – 16.00 each day. This field is already in bloom and apparently they have got A LOT taller than last year AND some are even red/orange in color! Last June (2015) there was a gorgeous sunflower field in Yomitan, I am hoping it blooms again this year and if/when it does I will be sure to update with directions; but its something to keep an eye out for! We did this one last year and decided to hike the entire way up! While the blossoms weren’t fully bloomed yet it was really beautiful! I think this is the festival I will try to get to this year, anyone been?! This was our first cherry blossom experience and thanks to the rain definitely one we will remember! Last January (2015) this cosmos field was gorgeous and I am so excited for it to bloom! My friend drove past Jan 2nd and said it was all still green, hopefully it won’t be too much longer! Location : GPS N 26 27.552 E 127 52.796 near highway 329. Look for an Esso Gas Station and the field will be on the other side of the road in the rice fields. We made it to this iris field last year; you may remember the photos of Clio wearing her santa hat walking through the fields of iris? Usually in bloom for the entire month of March with the festival lasting about 3 weeks. Another raining day adventure for us last year, hopefully this year the sun will be out when we visit! I think this is quite possibly my favorite, I have yet to see a photo that really captures the beauty and quantity of the thousands of hydrangeas so my advice go check it out for yourself! Have you been to any/all of these? What are your favorites? I love this post Hannah! I am so keen to get to all of these this year! We did the Nakijin Castle cherry blossoms. We were there during the day and at night. It was kinda neat all lit up. There’s pictures here. http://moreramblingsofamarinewife.com/2013/01/nakijin-castle-cherry-blossom-festival.html. I liked the Azalea Festival too, but the drive was soooo long. I think I took the kids when my husband was deployed. While we were up there, we stopped to see a couple waterfalls. I’m all about packing in as much in a day as possible! Oh that sounds really cool being there for both day & Night, I might try do that this year too! Yeah I like to pack in lots in a day or at the very least lots of food stops ha! Thank you for compiling a list! I’ve been anxiously awaiting the season to begin to visit. Its so close too! I can’t wait to get venturing out! I definitely hope to make it to at least one cherry blossom event, the cosmos and the hydrangea garden. Of course if I can make it to all I will! This is the most fabulous compilation ever!! THANK YOU!!! We didn’t make it to ANY flower things last year and I am so excited to get out to some if not all of these this year!! Oh I hope you make it to some/all of them! It will definitely be one of the big things I will miss about Okinawa! This is such perfect timing! We have less than a year left here and I was just telling my husband that this is on my bucket list, since we have only been to cherry blossom festivals so far! Thank you! I did hear that the Kitanagusuku one is canceled?? Not sure if that is correct though. Can’t wait! Oh I hope you make it to some Jessi they really are beautiful! Definitely get to the hydrangea garden, its out of this world! I have heard rumors about the sunflowers, so sad! I want to try get there this weekend just to see for myself; I’m still holding out hope! 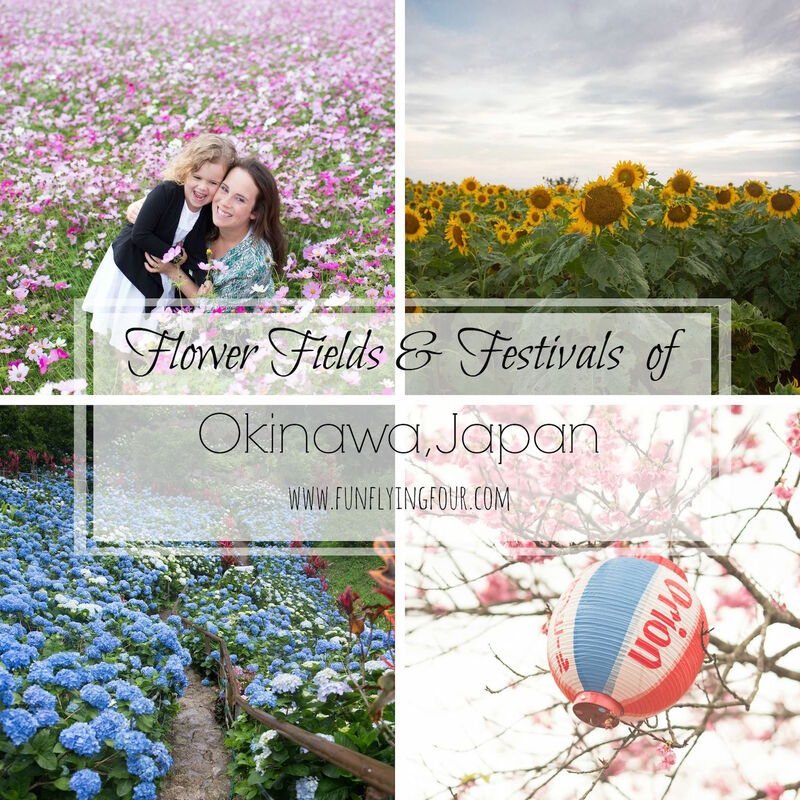 I’m more than a little obsessed with flowers and these fields were my biggest excitement for moving to oki! We did the cherry blossoms at the castle and a few other small spots. There are already some Cosmo fields blooming up by the Motobu peninsula! Hi Hannah! Just wanted to update you on the cosmos fields, went by today 1/16/16 and not a bloom in sight. Anxiously awaiting them to be ready! Thank you for helping me add to my Oki bucket list. Possibly going to cosmos field today if it is pretty outside.